There are many books written by People with Parkinson’s, many of whom also write PD blogs. Some are good, some are dreadful. There is a saying about PD bloggers, that if you write a blog, you will write a book. I don’t necessarily agree with this because in today’s world of sound bites and short attention spans, many of us write about whatever interests us at the time we are writing a blog post. There is no narrative, just a collection of short essays (do they even qualify as essays anymore?) that don’t always fit together. For those of you who were diagnosed a while ago, there may be nothing new here, but I would love to hear any suggestions for books that I have missed. 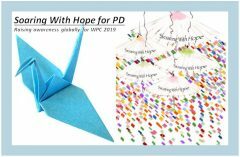 For those of you who are newly diagnosed, I hope that this will be give you a good place to start learning about how you can live well with PD. I have listened to a number of these books on Audible, especially when they have been narrated by the author. Hearing it in their own voice often lends subtleties to the narrative that you don’t get just by reading the book. I also like to listen while I am out walking. Sometimes you have to keep going just to finish listening to a good chapter, so it can help you get closer to your exercise goal at the same time! By the way, these make great gifts for People with Parkinson’s and/or their Care Partners. 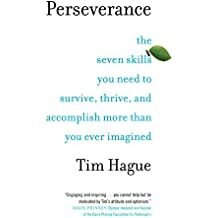 Perseverance: The Seven Skills You Need to Survive, Thrive, and Accomplish More Than You Ever Imagined by Tim Hague – Hague was diagnosed with YOPD at age 46 and won Canada’s Amazing Race race with his son, Tim Jr., 3 years later. The highlight of the book is his blow by blow account of the Race, which he (and his opponents) never expected to win. Hague is truly inspirational in talking about how he lives his life to the fullest with PD. Listen to it if you can. Whether or not you have Parkinson’s, you will be inspired to live your best. Parkinson’s? You’re kidding me, right? : One woman’s unshakeable belief in overcoming a shaky diagnosis! by Sheryl Jedlinski. Jedlinski was one of the firstbloggers that I followed. Always informative, humorous and a good read. A great book for the newly diagnosed. Brain Storms: The Race to Unlock the Mysteries of Parkinson’s Disease by Jon Palfreman. Still my all time favorite. After his own diagnosis with PD, Palfreman, an awardscience journalist, wrote this insightful book about the doctors, researchers, and patients who continue to hunt for a cure for Parkinson’s Disease. A must read for anyone with PD and their families. 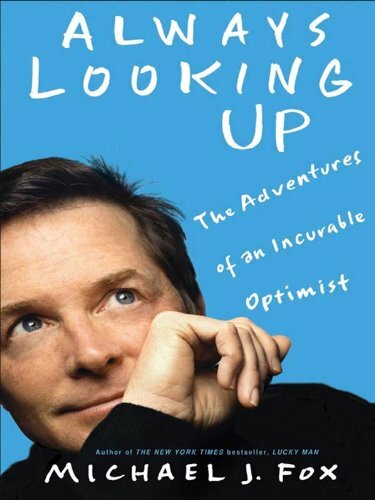 Always Looking Up: The Adventures of an Incurable Optimist by Michael J Fox. I recommend listening to this book if you can. Fox is always inspirational and you can almost see the twinkle in his eye as he narrates the book. 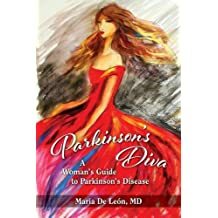 Parkinson’s Diva by Dr. Maria de Leon. Fun, informative book for women with PD by Dr. Maria who was a Movement Disorders Specialist before she was diagnosed with YOPD. We met three years ago at the Women & PD Initiative conference sponsored by the Parkinson’s Foundation and have become good friends. Maria tells it like it is, with lots of humor along the way. I challenge you to not laugh when you read about her experience after a massage. Parkinson’s Treatment: 10 Secrets to a Happier Life: English Edition and 10 Breakthrough Therapies for Parkinson’s Disease: English Edition by Dr. Michael S. Okun. Two very good informative books written by the National Medical Director of the Parkinson’s Foundation. I am looking forward to meeting more Parkinson’s authors at the World Parkinson’s Congress in June. I hope to find some new favorites to add to my list. The 7 books listed here should keep you busy reading until then. There are more listed under the heading My Books and Things I Like If you have a favorite that is not on my list, please let me know (preferably in the Comments so that others can see it). I know you are all waiting eagerly for the results of the very unscientific study that was posted a couple of weeks ago about dominant hand and the start of Parkinson’s symptoms. As of two days ago there were 299 responses in various forms. Interesting trivia – 3 reported being naturally left-handed but forced to write with their right hand in school. Their tremors started on left side. I counted these as starting on the dominant side. One of the things I learned is that most people preferred to just respond with a yes or no on Facebook instead of using the Survey Monkey link provided, and later the WordPress Poll. I changed to the much simpler poll when I saw how people were responding. Since this post was shared numerous times on FB (over 140!) I have no way of knowing how many people actually responded. So the most important thing that came out of this is that Parkies don’t pay attention to instructions! A simple yes or no was all that you wanted to give. And some of the answers didn’t even make sense! Somehow there has to be a way to make use of social media to reach out to large numbers of people and get the data that you want. It can’t be too complicated, for it seems that our reduced attention spans don’t allow for more complex answers. Dan continues to do very well with the Path Finder shoes. When he turned them over to Vince, he felt a definite increase in this freezing episodes. Vince tried it out with his PT, but it did not work for him, unfortunately. He returned the shoes to Dan, who is now a very happy camper. I have asked him to write about his experience so that I can share it with you here in a future post. One of the first blogs that I followed after my diagnosis was PDPlan4Life which was written by Sheryl Jedlinski and Jean Burns. Sheryl’s humorous writing and Jean’s illustrations gave me hope that I could live well with PD. 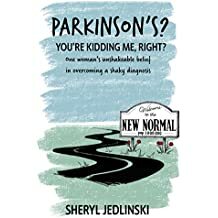 When I heard that Sheryl recently published Parkinson’s? You’re kidding me, right? : One woman’s unshakeable belief in overcoming a shaky diagnosis! , I immediately ordered the book. I was not disappointed. Wit h a blend of serious information for the newly diagnosed so newly diagnosed) and self-deprecating humor used to illustrate her points, Jedlinski has written a very enjoyable book that belongs on every Parkie’s bookshelf. We can all identify with some of the situations that she has found herself in as a result of living with PD. Finally, I am in Israel for 2 weeks, mostly on vacation, but some PD related business. There is some great research going on here which I hope to be able to share with you in my next post. …we’re going to learn how to feel good, we’re going to learn about our body’s rhythm and patterns, and pay attention to our body language and our facial expressions. By changing our script and eliminating our behavior of fear, we can bring ourselves back to a place where our natural movements dominate our Parkinson’s movements. Last fall I ordered the not yet published book, Goodbye Parkinson’s, Hello life! I eagerly awaited this new book on exercise for Parkinson’s which sounded very promising. After all, I am willing to try just about any form of exercise that will help. The book came last month and I have been playing with the exercises outlined by author Alex Kerten. The basic theory laid out by Kerten, an exercise physiologist based in Herzliya, Israel, is that with movement, music and rhythm – creating motion in the body – you stimulate simultaneous physiological, biological and psychological reactions. This will bring you back to a place where your natural movements dominate your Parkinson’s movements. This is the foundation of what he calls the Gyro-Kinetic method. Throughout the book he uses the “Oscars” as a metaphor for moving through life with PD. By changing the movie script of our lives after diagnosis, we can actually break out of the acquired chronic habits of Parkinson’s. We must become Parkinson’s Warriors; throw away the script that has been handed to us and write a new one. First, Kerten stresses that this program is to be used as a complement to, not instead of, a medication program. He says you will feel better by learning about certain behavior patterns that create chemical imbalances that take you away from your home-base center of balance and contentment. The goal is to learn how to regain that center by synchronizing your thoughts and actions. The exercises are designed to put you in touch with your body, focusing on breathing, movement, self-massage, conducting music and improvised dances. This will help you learn to regain your abilities that have been curtailed by PD. By doing this, Kerten says you can “FAKE IT UNTIL YOU MAKE IT” and win an Oscar for acting out the script of “I’m a Healthy Person with Parkinson’s Symptoms.” There are the usual testimonials from doctors and patients regarding the benefits of the Gyro-Kinetics method and much more information about Parkinson’s Disease. But the heart of the book is the exercises. What I love about the them is that you can do them anywhere. Just put on some music and start moving. The written descriptions of the exercises can be a little confusing, so take the time to go to the website and view the 6 minute video of some of the exercises before you start. You begin by moving your feet, then add your hands and facial expressions. Then combine all. After that you get to conduct the music. (Did you know that conductor’s have a longer than average life expectancy because of the physical exercise involved in conducting?) By conducting, you become one with the music. And finally there is free dance. Just keep moving and don’t worry about how you look. There are more exercises in the book and Kerten also offers on-line Skype sessions if you need more personalized attention. So far, I’m a fan. There is a good chance that if friends and family can’t find me, I will be dancing privately somewhere no one can see how silly I look. And having a great time doing it. I have been listening to books on Audible for a while now, usually when I am walking or driving. 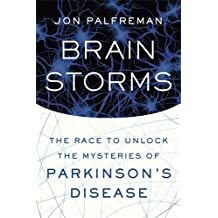 Few have kept my interest like Jon Palfreman’s new book Brain Storms, The Race to Unlock the Mysteries of Parkinson’s Disease. Unlike other audiobooks, I rarely had to back track to find out what I missed while distracted by something else. The book was engaging, informative and written in language that a reader with no medical background could understand. Palferman was diagnosed with Parkinson’s at about the same time that I was and at about the same age. He also seems to have had a similar trajectory in the progress of the disease. He is a medical science journalist, and in that role, he oftened covered scientific discoveries leading to treatments and cures of chronic diseases. Thirty years ago he produced a documentary film for Nova, The Case of the Frozen Addict, about drug addicts who had developed Parkinson’s like symptoms as a result of bad street drugs. He is also a professor of journalism at the University of Oregon. His diagnosis, like mine, initially led to denial, secrecy, depression and isolation. He was determined to hide the disease for as long as possible. I can’t imagine anyone shouting to the world that he has just had been diagnosed with Parkinson’s Disease. After all, the image of Parkinson’s conjurs up an elderly person, shuffling with a stooped back, dementia and an obvious tremor. This is not a disease anyone looks forward to having since we can only treat the symptoms. There is not yet a cure or even a guaranteed treatment to slow down the progression of the disease. Through the book, Palfreman confronts that image and turns it upside down. He discusses the sea change that occurred when Michael J Fox set up his foundation to find a cure now. He interviews Parkies who have made it theirs life’s mission to confront the disease and live with it on their terms. One example includes dancer Patricia Quinn, who developed a dance program to counteract her symptoms and continues to live well many years later. He has also interviewed others who have deteriorated rapidly and even goes so far as to project what his future will bring as a result. Palferman also talks abut the fascinating history of the disease, beginning with descriptions from the ancient Greeks, leading up to James Parkinson’s famous essay on the Shaking Palsy nearly 200 years ago. He talks about how treatments were developed, and even chronicles the descendents of a family in a small village in Italy who were essential in helping to discover genetic markers for PD. Because the book was just published, he goes into great detail on the latest research about repurposing drugs for other diseases that have been somewhat successful in reversing PD in limited trials. This is exciting news that has been talked about all summer. Because these drugs have already been FDA approved for other diseases, the approval process is shortened significantly, if researchers can get enough patients to conduct Phase III trials. He ends the book with a bright future for those of us with PD as a result of the flurry of discoveries made in the last few years about PD and treatments for slowing down and ultimately reversing the disease. And finally, this is a very personal story about living with Parkinson’s disease and how a chronic disease will change a person’s life forever. That change can be positive, which is something I have heard from so many people with Parkinson’s. Once we get throught the denial, we can move forward and live our lives fully.